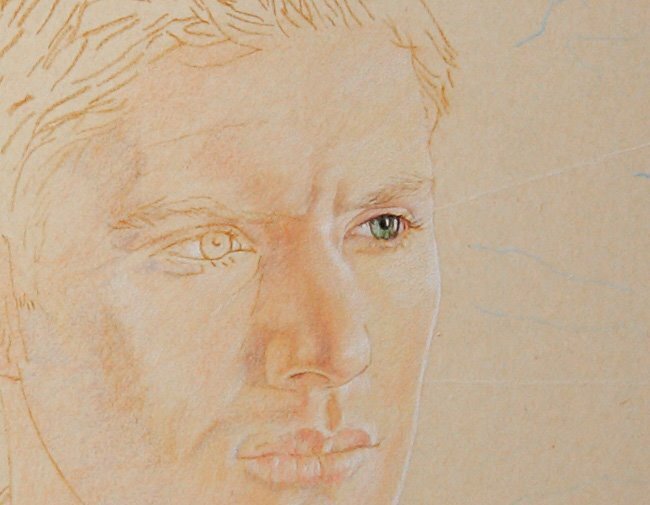 When I came back to work on this piece, I began to layer colors on Dean's face. 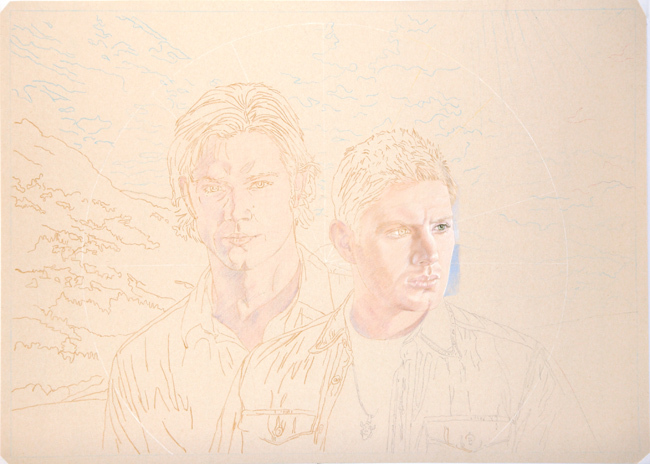 I was going at it very slowly and probably being way too tentative, but I wasn't sure how to work the layers yet. I did know that there has to be enough colors deposited on the paper before you can blend them with added layers, with brushes or with your fingers. 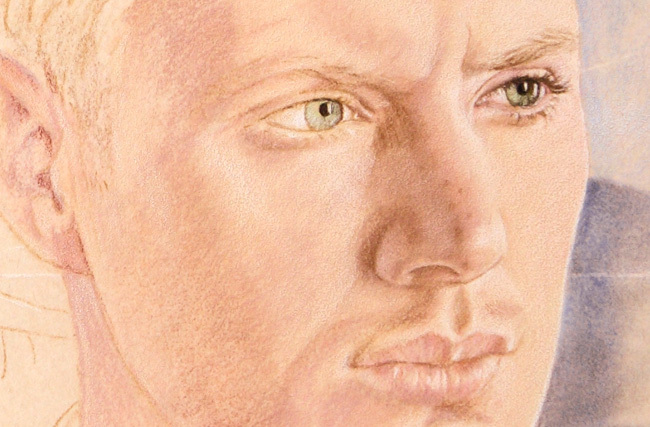 The part of Dean's face I started on was not really a good place to test this out because I wanted it to remain as one of the lightest spots in the whole piece. I really couldn't add too many other colors into the mix apart from the pale pinks, yellows and creams here. As a side note, I found a great new color to use in the highlights for skin tones. The color is Buff Titanium from a trial batch of Caran d'ache Luminance pencils I bought recently. Before this I had almost exclusively been using Prismacolors. It finally clicked with me that maybe I should try out some other brands, especially the ones praised highly on other people's blogs. I had been using white to try to blend into the pinks and yellows to get highlights and brighter skin tones, but the white just made the color look too cold. That's fine if the effect you want is silvery or cool light, but for a warmer bright like the one I want for this piece, it just wasn't working. I want the colors in this portrait to be as if the figures were in bright daylight, the skin tones tan and maybe a bit golden. Titanium buff is an off white ivory color, warmer than stark white, but not as yellow as the Prismacolor cream color. In the close-up you can appreciate the blended color a little better. Of course now it is probably too white. 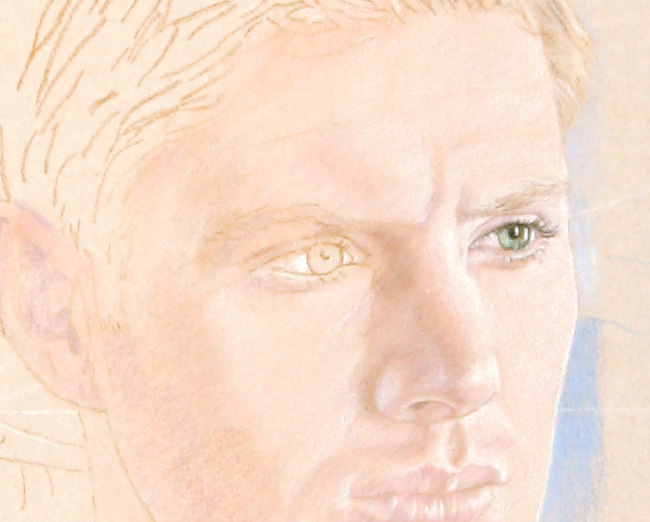 In the next shot, I have layered a little more color into the shadow areas of Dean's face, added darker colors in the bit of background on the right and also put some color in his hair. I probably should have done this before and not got so caught up working the brights on his face. Applying colors to the surrounding areas gives you a better idea of how everything is going to work together eventually. I realized I needed to see some of the dark areas to judge the lights better. Now that I think of it, I'm sure I stumbled to this conclusion previously, but it must not have impressed itself sufficiently on my brain. Hopefully it will take better now. 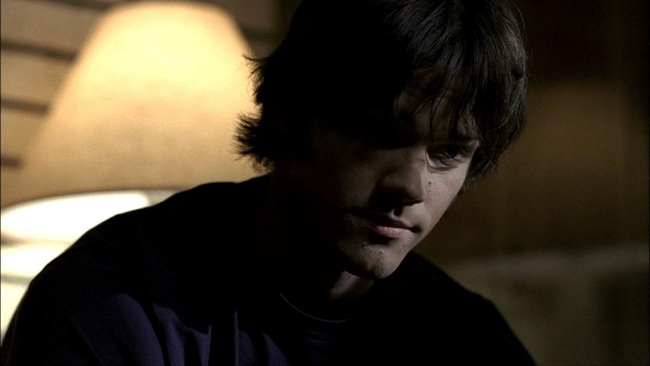 It was hard to tear myself away from working on Deans features, especially his nose and lips. 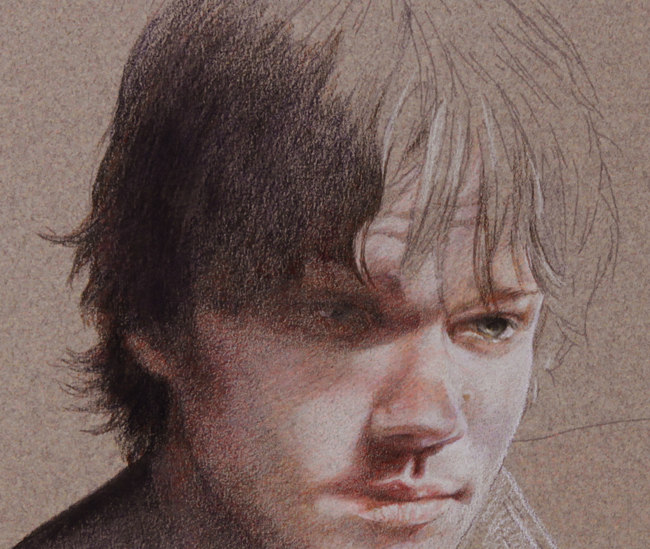 I would be trying to work on the shadows when before I knew it I would be back to tweaking his top lip or eyelid. I indulged myself a bit more by seeing if I could put a few freckles on his nose before firmly turning my attention to other areas. And this is about as far as I got on an April weekend some weeks ago. I started this other project some weeks ago and have made some progress which I will now log here. 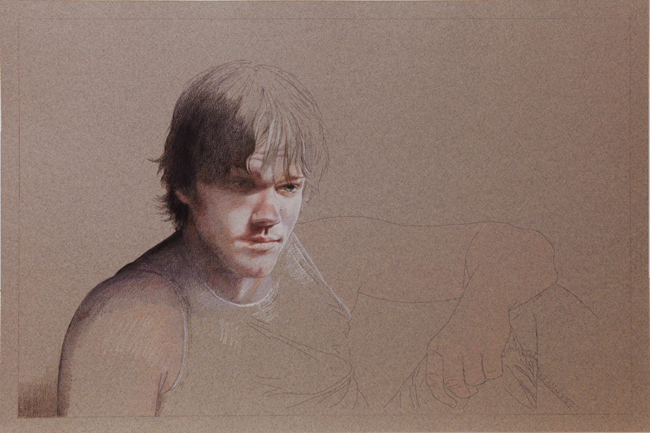 I also used the Fisher 400 paper on this one but I chose to use colored pencil instead of pastel as the medium. I wanted to test the paper with both the pastel and colored pencil mediums. I ordered two 20 x 28 and two 14x 20 sheets of the Fisher400 paper about a month and a half ago. I was eager to try it out, having heard some pretty good things about it. Having now dabbled a bit on this paper I have to agree that so far it seems quite wonderful. The Fisher 400 paper looks just like a fine gauge sandpaper, though it is manufactured solely as art paper. I had to order it from England, since the artist who created it does not have any US distributors yet. I sure hope that it becomes available more locally soon. 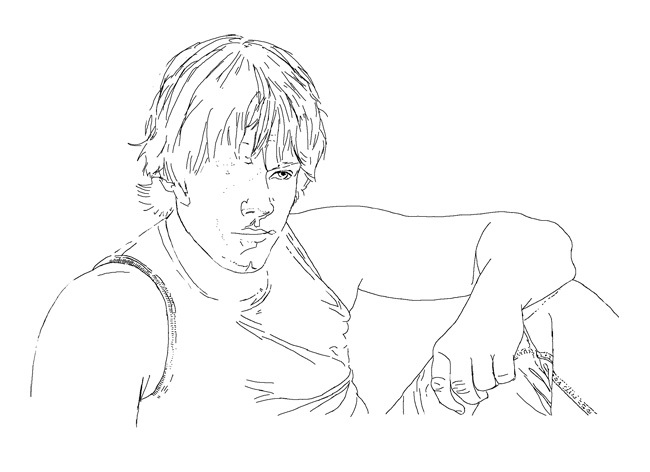 I made a collage from reference photos in Photoshop and traced out this sketch. 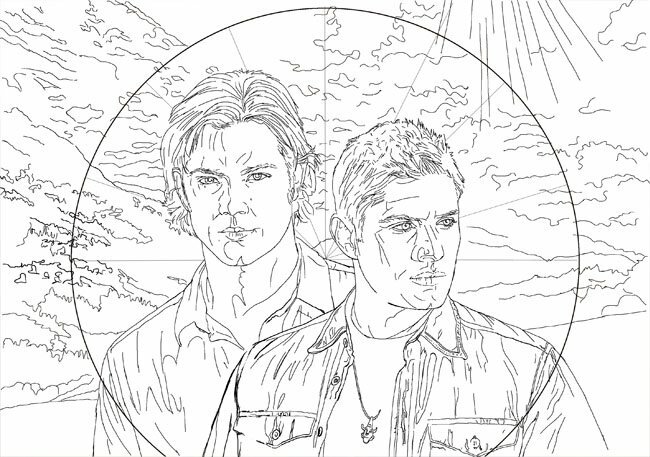 It's a composition of my favorite subjects Sam and Dean from the TV show Supernatural. I'm calling this piece Follow Me. 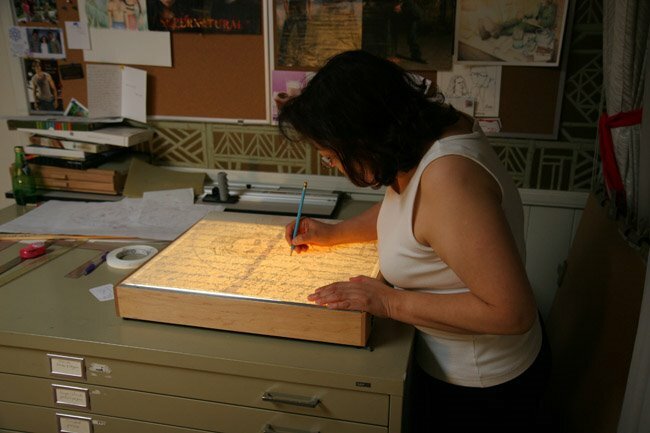 I was able to use my lightbox to transfer my sketch to the paper. Fortunately I discovered that this paper is translucent enough to use with the lightbox. This is good news because I had the dubious pleasure of copying the sketch for the pastel piece using transfer paper and it was a pain. Here I am working away at it. It took me a few hours to finish transferring all the little lines, but I've learned patience. The more details you capture the easier it is to draw later. Here is a bad picture of the transferred drawing. I have to get a better set up next time. My daylight source was off to one side and when I tried to add light with my fluorescent drawing table lamp, it just added another color cast, which I was unable to remove. Still it gives a good idea of how it looked. 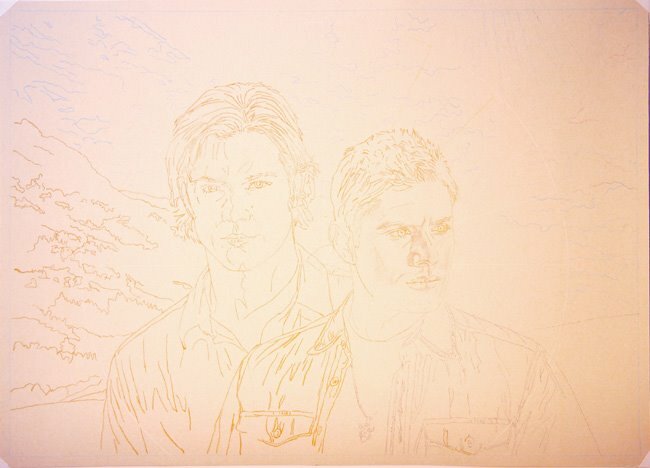 I used a couple of different colored pencil to transfer the lines, blue ones for the clouds, some grey for part of Deans shirt, white for the circle around the figures and a brownish ochre for all the rest. Mostly it was just experimenting. I also varied the pressure. I think the right side is probably a little too faint, though I finished off at a pretty good line thickness on the left. 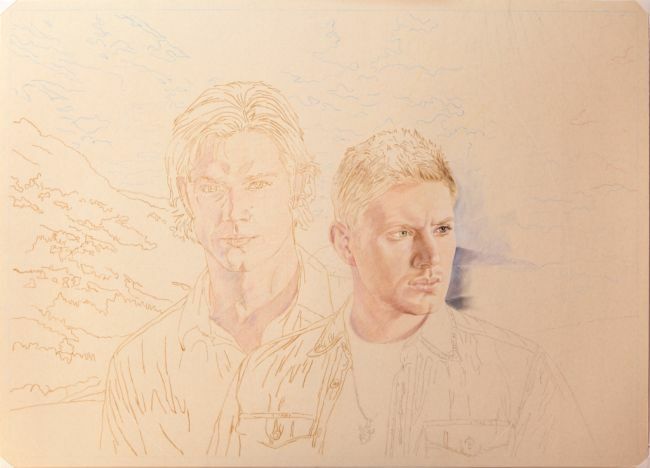 I almost forgot to take a picture at this stage.That is why Dean's face actually shows some shadowing which I had started to block in. Fortunately I still captured the mostly un-worked line drawing. All the brainstorming for the composition, drawing the sketch and getting it transferred took most of a weekend. I finally got it to the point of starting to draw and was able to get this far. I got a better picture this time, though it is still shadowed on the right. I think this paper is going to hook me completely. It takes color incredibly well. 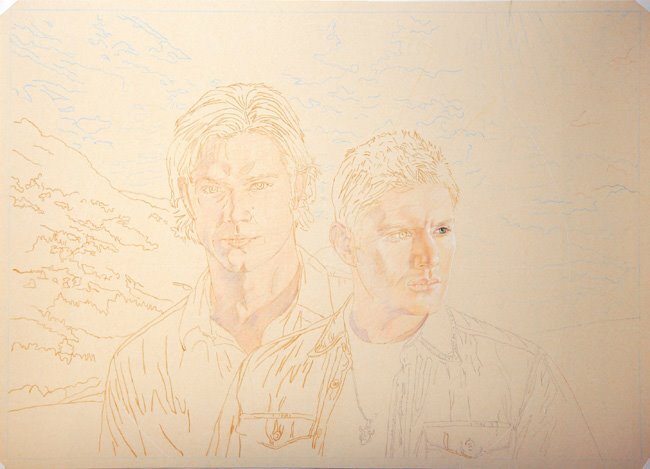 I have barely gotten started but I can tell I will be able to layer lots and lots of color on it. I'm also going to get hooked on working at this large size paper. The 20x28 inch size gives me such control over the drawing of details on the face. One thing though, this paper is going to eat my pencils by the bushel. Here is a close up of my start. The layering has just begun, but I couldn't resist working his eye more, to catch a glimpse of what this paper might yield.